An 84-year-old woman was referred for transcatheter aortic valve replacement (TAVR) without cardiovascular risk factors, except for remote tobacco abuse more than 30 years earlier. She had been diagnosed with aortic stenosis (AS) and managed conservatively by means of annual echocardiographic assessment for the previous 5 years. Approximately 2 weeks prior to consultation, she was admitted with flash pulmonary edema that was treated with diuretics. At the time of consultation, the patient was stable without angina or lightheadedness. The patient lives by herself and is able to perform her activities of daily living. Her medical history included lung cancer (stage IB) treated 8 years earlier with image-guided robotic stereotactic radiosurgery (CyberKnife, Accuray Incorporated), chronic lung disease with an FEV1 40% of predicted without improvement with bronchodilators and an O2 saturation decrease of 89% after walking 700 feet, hypertension, and osteoporosis. Her renal function was preserved with a glomerular filtration rate of 84 mL/min and a creatinine of 0.56 mg/dL. Physical examination revealed that she was a thin and frail-appearing woman with a body mass index of 22.26 kg/m2 (height, 152 cm; weight, 51 kg) who uses a walker to ambulate. The lungs were clear to auscultation. She had a 2/6 crescendo-decrescendo systolic murmur that obscured S2. Echocardiography revealed severe AS with a valve area of 0.58 cm2, aortic maximum/mean pressure gradients of 108.6/72 mm Hg, and a peak aortic valve velocity of 5.21 m/s (Figure 1). There was no aortic regurgitation. The ejection fraction was preserved (65%) and there was severe mitral annular calcification causing mild mitral stenosis (valve area, 1.8 cm2). Coronary angiography demonstrated nonobstructive coronary artery disease. 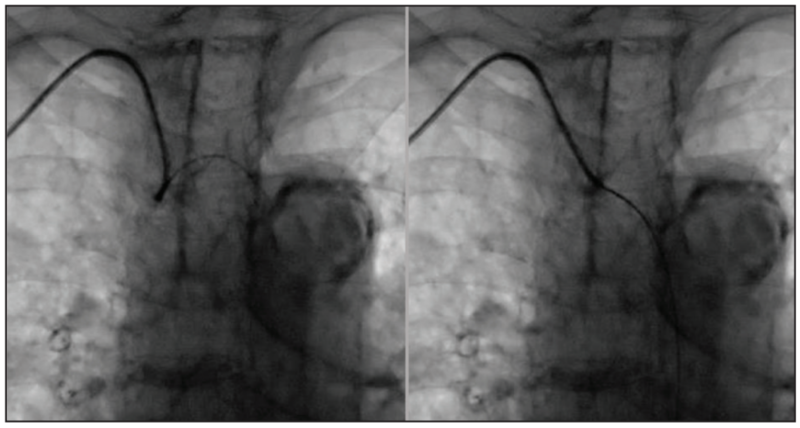 Of note, coronary angiography was performed via right transradial access and significant subclavian tortuosity was encountered while advancing the J-wire, but the vessel straightened, posing no added difficulties to performing the procedure (Figure 2). Hemodynamic assessment showed a peak aortic gradient of 104 mm Hg with an aortic valve area of 0.34 cm2 (Fick principle) (Figure 1). The pulmonary arterial pressure was 48/18/(29) mm Hg. Based on the type of procedure and patient data, the Society of Thoracic Surgeons (STS) predicted risk of mortality was 11.6%. Figure 1. Echocardiographic and hemodynamic assessments of AS. Figure 2. Catheter navigation demonstrated significant subclavian tortuosity that straightened after passing the wire. Do you believe that this patient is an eligible TAVR candidate? Based on the data presented so far, what do you think are the major periprocedural risks that this patient faces? Dr. O’Neill: This 84-year-old patient is severely symptomatic from critical AS, with multiple comorbidities that make her a prohibitive risk/inoperable candidate for traditional surgical AVR (SAVR). She is typical of patients enrolled in the PARTNER IB trial, in which patients who were randomized to medical therapy had a 50% 1-year mortality rate, whereas patients who were treated with TAVR had a much higher rate of survival. Given the patient’s presentation, we would absolutely consider her for TAVR at our center. Dr. Garcia: This patient is an appropriate TAVR candidate because she has a clear indication for valve replacement on the basis of very severe (peak velocity > 5 m/s) AS and symptoms of heart failure. Her STS score (11%) predicts a high 30-day mortality risk with SAVR. The major periprocedural risks are related to poor baseline functional status and advanced comorbidities (ie, chronic obstructive pulmonary disease [COPD]), which may hamper rehabilitation and increase the risk of prolonged ventilation. Consideration should be given to a minimalistic approach under monitored anesthesia care. Dr. Szerlip: Yes, this patient is eligible for a TAVR procedure. Her first presentation of symptoms from AS was acute heart failure. Although the case does not specify, I assume that the patient is now out of the hospital and back home. If this is the case, then TAVR will help her resume her lifestyle. Although she may appear frail, before presentation at the hospital, she had been living by herself at home. Periprocedurally, I would elect for moderate sedation of the patient given her former lung disease and would choose a transfemoral access approach, if appropriate. Her mitral annular calcification is concerning, and I would consider using a self-expanding valve if she had an extreme amount of left ventricular outflow tract (LVOT) calcification. Gated CT demonstrated a trileaflet aortic valve with an annular area of 350.5 mm2, a perimeter of 67.1 mm, and a smallest sinus of Valsalva diameter of 27.5 mm. The aortic annular plane angle was 57° (Figure 3). Figure 3. Tomographic measurements of the aortic annulus and the sinuses of Valsalva. Assuming that the patient is a candidate for transfemoral access, how would you plan the procedure in terms of anesthesia, need for transesophageal echocardiography (TEE), and transcatheter heart valve selection? Dr. Garcia: I would plan for a minimalistic approach under monitored anesthesia care without TEE guidance. The anatomy is suitable for a 23-mm balloon-expandable or a 26-mm self-expanding valve. A 23-mm Sapien 3 valve (Edwards Lifesciences) would provide a 16% oversizing, whereas a 26-mm Evolut PRO device (Medtronic) would provide a 22% oversizing. As part of the valve selection, I would examine the baseline electrocardiogram to evaluate for the risk of pacemaker implantation (ie, right bundle branch block), medication list (steroids increase the risk of annular rupture), and LVOT calcifications. The size and tortuosity of the iliofemoral vessels need to be assessed. Dr. Szerlip: If the femoral arteries were large enough, my approach would be transfemoral. I would use either a 23-mm Sapien 3 valve or 26-mm Evolut PRO, depending on the calcium pattern in the LVOT. I would do this under moderate sedation and transthoracic echocardiography. To me, you do not gain much from TEE and general anesthesia adds extra time to the patient’s length of stay. Dr. O’Neill: This patient’s case is complicated by the fact that she has poor vascular access. At Henry Ford Hospital, transcaval and transcarotid access are our top two alternate access techniques. We currently use nontransfemoral access in 18% of our cases, which has allowed an exceptionally low rate of femoral complications because we have a low threshold to avoid all but the most straightforward cases with the transfemoral approach. Among the last 500 cases, we have been unable to perform transcaval or transcarotid procedures in only three cases; those patients were treated using subclavian access. I cannot remember a case in the last 3 years in which we could not achieve access to implant a valve. If this patient was to be treated with transfemoral access, we would use deep sedation administered by an anesthesiologist. We use carotid protection in all cases that are anatomically suitable. We do not routinely use TEE or transthoracic echocardiography. Currently, we use Sapien 3 valves in 85% of cases and CoreValve device (Medtronic) in the rest. We have been reluctant to expand use of the CoreValve because of the higher rate of pacemaker implantation. I must say that as we gain more experience with the Evolut PRO device, we are impressed with its ease of delivery and low rate of paravalvular leak. The abdominal aorta had extensive calcification with a longest calcium gap of 4.5 mm in the aortic wall adjacent to the inferior vena cava. The iliofemoral vessels were severely narrowed and heavily calcified with minimum diameters of 2.2 mm in the left common iliac and 4 mm in the right common femoral arteries (Figure 4). The minimum subclavian diameter was 4.3 mm. The aortic root was relatively free of calcium (Figure 5). Figure 4. CT scan of the abdominal aorta and the iliofemoral arteries demonstrating heavy calcification and narrowed segments. Figure 5. CT scan of the chest demonstrating significant narrowing and heavy calcification of the left subclavian artery. Based on CT data, the patient is clearly not a candidate for transfemoral or left subclavian access. What are the remaining vascular access options for TAVR, and how would you plan this case in your institution? What would be the most convenient approach and transcatheter valve choice in this case, considering the anatomy and patient comorbidities? Dr. Szerlip: Given that the femoral and left subclavian arteries are not good options, I would next consider the right subclavian approach. The inferior vena cava is out because of the aortic calcification. A transapical or direct aortic approach may be possible, but these would be harder to recover from due to the patient’s frailty. Additionally, carotid or transmediastinal approaches are also options. My first choice, however, would be right subclavian access, which would be done using a percutaneous transaxillary approach under moderate sedation. Transaxillary access with a surgical cutdown under general anesthesia could also be done. The images provided show no LVOT calcium; therefore, I would choose to use a 23-mm Sapien 3 valve. A 26-mm Evolut PRO device would also be acceptable. Dr. O’Neill: This patient was not a candidate for transfemoral delivery. The case states the abdominal aorta is not suitable for transcaval approaches; however, we rarely find this to be the case. We are usually able to find a spot that is calcium-free between the L2 and L4 lumbar spaces. There are cases of laminated thrombus or aortic dissection or bowel loops between the inferior vena cava and aorta that can preclude a transcaval approach but can all be assessed by abdominal contrast CT scans. Although her age, body habitus, and poor lung function make her very high risk for surgery, she has excellent renal function, is bright and self-sufficient, and is very thin. These are all very favorable factors. If heart block does not occur, at our center, she would be admitted to our dedicated TAVR unit and observed the evening of the procedure. Early the next morning, she would have a complete mobility assessment by our physical therapy department. If she ambulated well, she would be released and sent home later that day. Dr. Garcia: The remaining options for vascular access include right subclavian, transcarotid, transapical, transaortic, and transcaval approaches. At our institution, we have accumulated experience with right subclavian access with excellent results; that would be our first option for this patient. We have moved away from transapical and transaortic access, even more so in patients with COPD. We found that the eSheath (Edwards Lifesciences) navigates tortuous vessels with relative ease. Also, the ability of the Commander delivery system (Edwards Lifesciences) to flex and retroflex allows for a more coaxial alignment of the transcatheter valve in relationship to the annular plane in challenging anatomies, such as in this case. For these reasons, I would choose a 23-mm Sapien 3 valve for this patient. The valve team considered that the patient was eligible for TAVR because she had no cognitive impairment, lived alone, and was able to perform her activities of daily living with minimal difficulty. However, because of frailty and advanced chronic lung disease, the CT surgery team considered that the patient was not a candidate for direct aortic or transapical access. Transcaval access was not an option because of extensive abdominal aortic calcification. Further CT analysis demonstrated that the right subclavian and innominate arteries were large enough, with a minimum diameter > 5.5 mm. Based on the experience with previous vessel navigation during cardiac catheterization demonstrating that the tortuous subclavian anatomy would be easily straightened, the patient underwent transaxillary TAVR with surgical cutdown, general anesthesia, and a 23-mm Sapien 3 transcatheter heart valve. Even though transseptal antegrade access was an option for this patient, we opted for transaxillary access because of her small left ventricular cavity with hypertrophy (Figure 3) and lower procedural risks. The patient went home a week after the procedure. Disclosures: Received research support from Edwards Lifesciences, VA Office of Research and Development (1IK2CX000699-01), and MN Veterans Research Foundation; consultant to Abbott, Medtronic, Edwards Lifesciences, Osprey Medical, and Surmodics, Inc. Disclosures: Consultant to Edwards, Medtronic, and Boston Scientific Corporation. Disclosures: Consultant and speaker for Edwards Lifesciences and Medtronic.